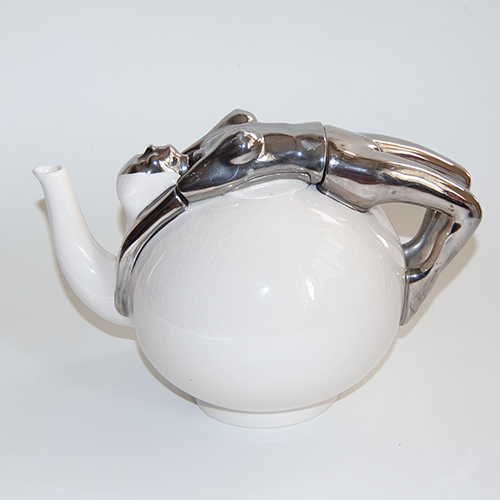 We have found another example of this extremely scarce variation from the "I've Lost My Little Willie" limited edition teapot modelled by Roger Michell for Lustre Pottery in the 1970s. This edition was based on the Donald McGill seaside postcard which started out with the title "I've Lost My Little Willie". We have recently seen a postcard with a variation of the title "I can't see My Little Charlie", and believe that as McGill had been prosecuted successfully for obscenity, that some captions may well have subsequently gone through some transmutations in order to tone down a more obvious sexual innuendo. So, in respect of this design, we believe there was a change in title from the original "I've Lost My Little Willie" to "I can't see My Little Willie" and eventually to "I can't see My Little Charlie". From conversations with Roger Michell about his limited edition teapots, I understand that less than 50 examples of this teapot were made and the decoration on this one is thought to be particularly scarce, he thought only a handful were made with the plain bathing costume with "I Can't See My Little Willie" written across the front and "Homage to Donald McGill" around the rim of the lid.The majority of this small edition comprised examples with the untitled striped bathing costume and without the dedication to Donald McGill. Condition is excellent with no damages or restorations. Marked to the base with Lustre Pottery's Backstamp - "LUSTRE MADE IN ENGLAND". Cf. Walking Ware A Collectors Guide by Julia Michell p.78 (available from this website - see "Walking Ware Book" link to the left of the pictures above).